Summary: From the celebrated author of The Bird Sisters, a gorgeously rendered and emotionally charged novel that spans generations, telling the story of two siblings, raised apart, attempting to share a life. I was a big fan of THE BIRD SISTERS, Rebecca Rasmussen's debut novel -- you can read my review here. She blew me away with her quirky characters and beautiful prose, and I was so impressed with how well she brought the setting to life. So it was with much excitement that I picked up her new novel EVERGREEN. EVERGREEN is once again a beautifully written novel with intriguing characters and a memorable setting. It spans three generations and, at its heart, is about family, love and loss. EVERGREEN begins in the late 1930s when Eveline moves to rural Minnesota to be with her new husband. Although she has to adjust to living off of the land in a small cabin, she and Emil are very much in love. Things get even better when Eveline discovers that she is pregnant and gives birth to a healthy baby boy Hux. When Emil learns that his father is very ill, he decides to return to Germany to say good-bye to his father one last time. Eveline is supposed to return to her parents' home while Emil's away, but she decides that she wants to stay with new (and eccentric) friend Lulu and fend for herself. And then Eveline's life takes a tragic turn. A man shows up at her cabin, forces his way in, and rapes her; and Eveline finds herself pregnant. She delivers a baby girl and drops her off at a Catholic orphanage; and Naamah is raised by an abusive nun. On Eveline's deathbed, she tells Hux that he has a sister. Hux is shaken by the news and sets out to find Naamah and bring her back to live with him. He locates her but soon discovers that Naamah is obviously emotionally damaged. Hux desperately wants to help her and show her his love; however, it might be too late for Naamah to recover and find some sense of normalcy in her life. 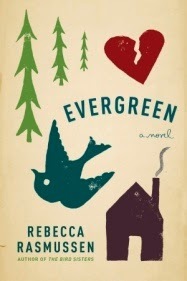 I really, really enjoyed EVERGREEN and thought it was a beautifully written story. These characters got inside my head and my heart and I couldn't stop thinking about them even after I finished the novel. (As far as I'm concerned, that's a sign of a very good book!) Once again, I was deeply impressed with Ms. Rasmussen's prose as well as how well she brought the setting to life. And I loved the beauty of the story -- both the tragedies and the joy. EVERGREEN both broke my heart (over and over again), while at the same time leaving me with a sense of hope! I've been in a bit of a mood at times this summer and I wasn't exactly sure EVERGREEN was a good fit for me. This is nothing against the book, but I had difficulties getting involved in the first half of the story. I don't think it was the characters because I really liked Eveline's story.. especially how much she changed when she first met Lulu. However, once Hux grew up and the story was more about him and Naamah, I found myself glued to this book. I just loved Hux and I think that's a big reason that I enjoyed this book so much. I liked how kind he was and how much he tried to help his sister. I truly believe he thought he could "fix" her. Hux was extremely likable but he was also complicated, and I found his actions and motivations to be interesting. I also found Naamah to be a fascinating character -- probably because she was so incredibly flawed. Her upbringing was tragic to say the least and so complicated, and it's no wonder since she was living with so many scars. When Hux finally found her, I had so much hope that she'd fully recover and find happiness. However, life definitely wasn't simple for these individuals. Naamah was torn between her past and her future and it had devastating effects on those who loved her. I don't want to give too much away about what happens after Hux finds Naamah, but suffice it to say, I liked it a lot. At first, it appeared that there would be happy endings for these characters. And then, it seemed like there wouldn't be, and truly, my heart broke for them. I seriously wanted something good to happen to these people -- they deserved it! However, ultimately, Ms. Rasmussen didn't disappoint me. The ending of this novel was beautiful and I absolutely loved it. I guess some would say that maybe it was a little too neat and tidy, but honestly, I needed that. I felt so close to some of these characters and this novel needed some sense of hope and redemption! I think EVERGREEN would make a terrific book club selection. The story and writing are beautiful and the characters are so interesting. Fortunately, there is a reading guide with twenty(!) questions. Some of the themes you might want to explore include family, love, loss, guilt, secrets, regret, abuse, fear, second chances, redemption, friendship, and hope. In addition, there are many symbols in this story that would be interesting to discuss like Lulu's coat and Tuna the bird. EVERGREEN is just a wonderfully written story that's guaranteed to touch your heart. Highly recommended. That sounds heartbreaking but I'm sure in Rasmussen's hands it's a beautiful story. What an absolutely lovely review! Thank you so much for reading and writing with so much insight about Evergreen. I wish I were coming that way again for the tour because I would love to see you! Wow! This one sounds very good! I'm going to add it to my list!